1. Click Sign up Button at the top right corner of the page or simply click here. 2. Fill out all the required information. 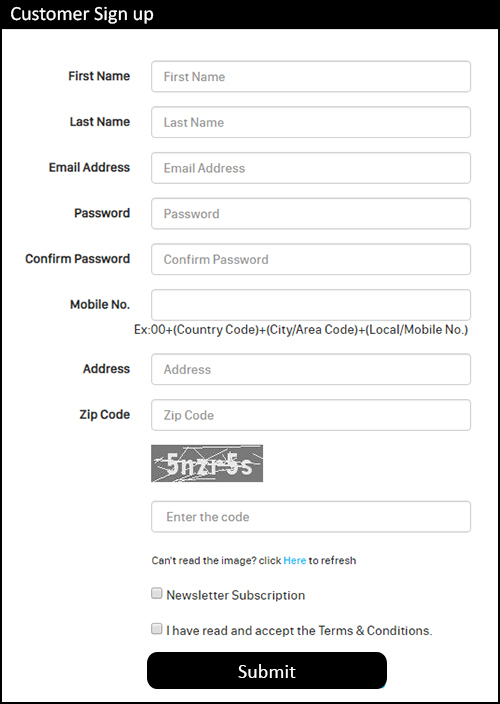 Check the Newsletter Subscription and Terms and Condition and click Submit. 3. Check your email for your accounts confirmation. 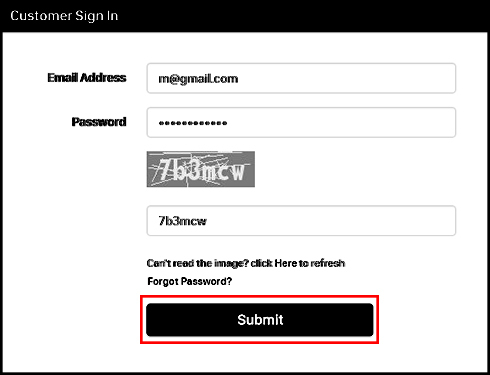 1.Log-in to your account or click here. 2. Click My Account button at the top right corner of the page. 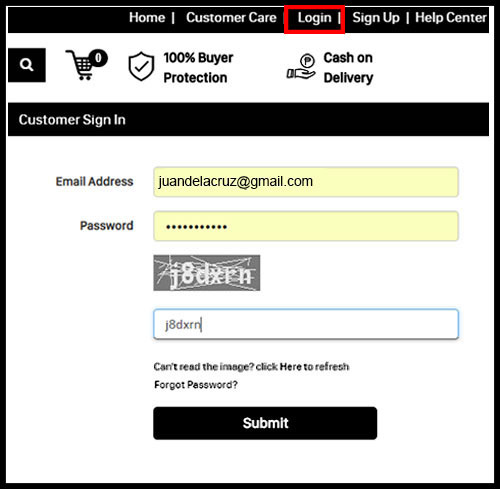 How to log-in as a customer? How to update my profile as a customer? 1. Log-in to your account or click here. 3. Click Update Profile tab. 4. Update your information and click Submit. I forgot my password as a customer, what should I do? 2. 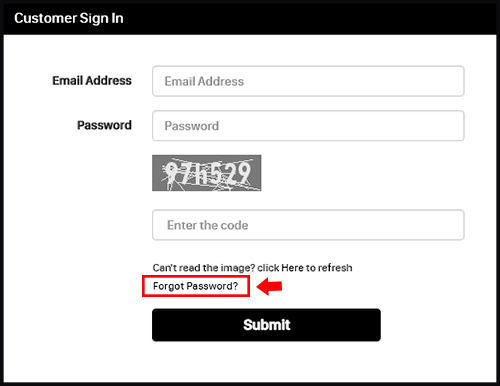 Click the Forgot Password link at the upper part of submit button. 3. Enter your email address and click Submit. 4. Please check your email and get your temporary password. Note: You may change your temporary password and create a new one. 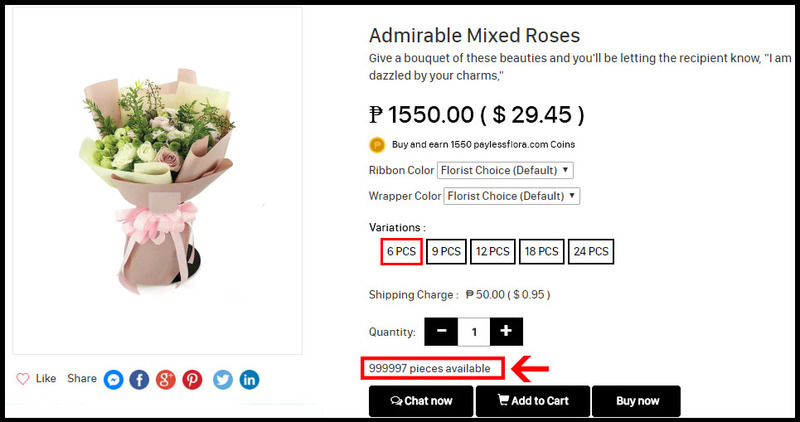 You must send us a request for cancellation through email at info@makatiflora.com and we have a 10% cancellation fee for Paypal Payment, once the payment has been made. Our process for cancellation/refund will take 7 working days. 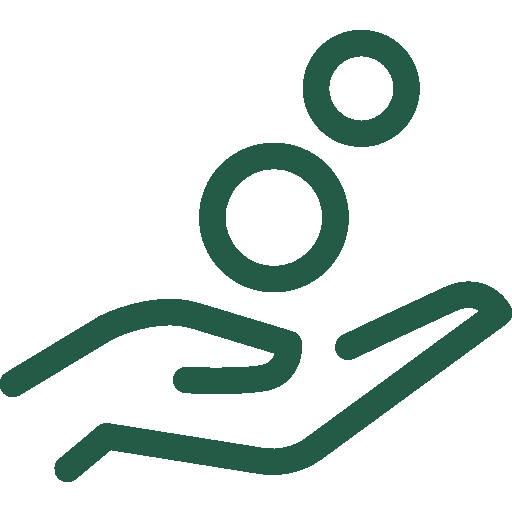 Orders cannot be cancelled once they have been designed and are on delivery, or if delivery has been attempted and cannot be completed if the recipient is unavailable. Orders that are placed with incorrect information (i.e. Wrong Address) that prevents direct delivery cannot be cancelled or refunded. We will deliver the said replacement after two days from the date of the complaint as long as it has a valid reason. We do not accept refund and cancellation of transactions once the item has been processed and delivered. Makati Flora will make every attempt to fill the order as requested. However, due to nature, seasonality and regional availability of the flowers, it is sometimes necessary to make substitutions of equal or greater value. As well, if a specific container or other items are not available we will make a substitution of equal or greater value. We will make every effort to maintain the "look and feel" of the specific arrangement by the overall shape, size, style and color combinations. 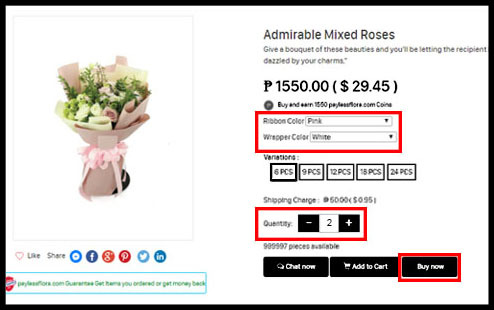 If an order is for a single type of flower color substitutions will be made only. For example, if white gerberas are not available a substitution of another color of gerberas will be made automatically or if the strawberries in fruit basket is not available we will replace it with other fruit of same or greater value. What qualifies the product to return? If you, or your recipient, receive flowers that are stale. 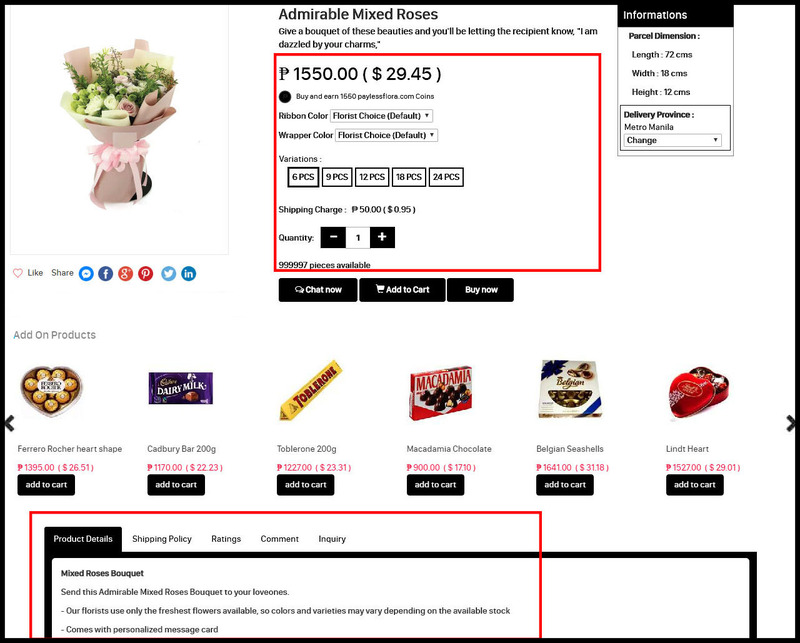 Or dried, or totally different from what declared in the Order Invoice emailed to you, please send us the photo within 24 hours of product receipt and we will gladly send you a new arrangement. We accept and deliver orders daily from Monday to Sunday for Metro Manila and from Monday to Saturday for Provincial areas. Our delivery schedule starts at 10:00 AM up to 7:00 PM only. 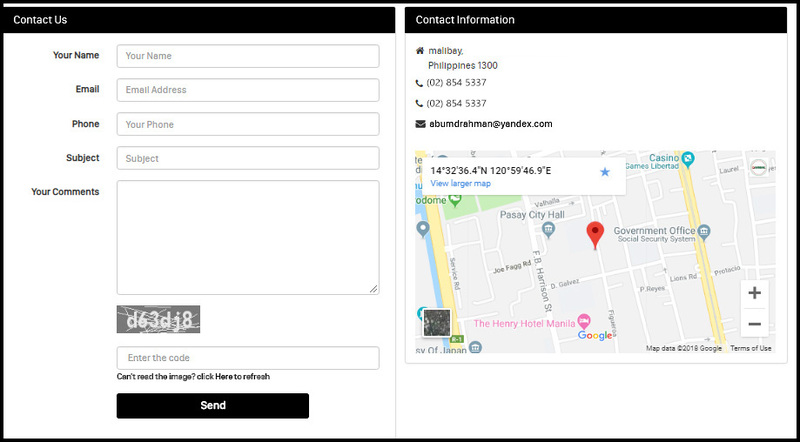 For customers who are requesting for a specific time of delivery, we advise to place your orders at least 3-4 days before the date of delivery and e-mail us at info@makatiflora.com and write your Order ID as the Subject then tell us what time you want your order to deliver (Eg. Before Lunch or, however, we CANNOT GUARANTEE an EXACT time of delivery. During special occasions like Christmas, Valentines, Mother's Day, etc. We do not promise a specific time of delivery but for those who placed their order a week advance will be prioritized and delivered first. 4. You can leave a message to know the state of your order(s). 5. You may also contact us on tracking your order. 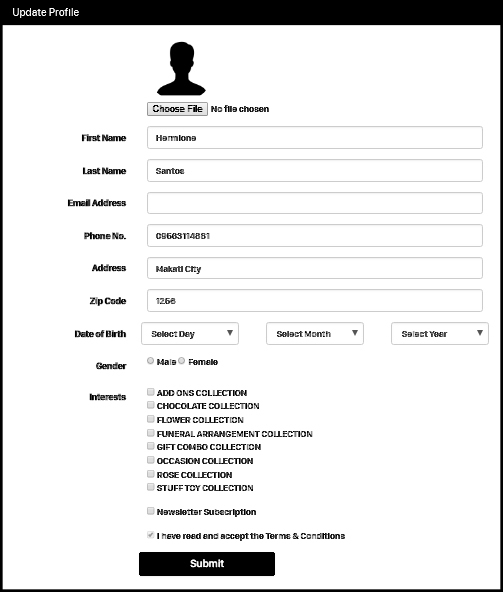 For customer who is requesting to be anonymous kindly e-mail us at info@makatiflora.com and write your Order ID as the subject of the email and your request. If you wish not to call your recipient and make a surprise delivery please send us an email 3 days before date of delivery but you have to make sure that your recipient will be available to receive your order if the recipient is not there or the address is incomplete or incorrect we will first contact your recipient but if your recipient is cannot be reached, your order will be returned to our office and we will notify you by email or call you and if we cannot reach you we will wait for your reply we can re-schedule the delivery of the items on the following day but you must settle first and pay again the shipping cost before we re-deliver your order. Same policy applies for incorrect or incomplete address. For perishable items (flowers, cake and etc.) if you want us to deliver a new and fresh item you must pay again the total amount of your order but if not we will redeliver the same item we first attempted to deliver. We are not responsible for deliveries made to incorrect or incomplete provincial addresses submitted by the customer. If the recipient's address is incorrect or incomplete and the delivery was attempted to the address, you have to pay again the shipping cost so we can redeliver your order on the following day but if more than one day and your order items are perishable you must pay the total amount of your order again if you wish to replace it with a new and fresh item. If such a delivery is made, the customer assumes responsibility for the entire purchase. We deliver from Monday to Saturday only in Provincial areas. Some areas in Provinces are not possible for Door to Door Service, in this case, we will notify the customer first by email and call before we process and ship the item. Once the item was shipped we will contact the recipient and inform them regarding the details where to pick up the item. Areas not possible for a door to door delivery are not exempted for the shipping cost of Luzon areas and Visayas/Mindanao areas. If either the recipient was not available and/or no authorize or reliable person were available to accept the order it will be returned to our office and we will notify you by email or call you and if we cannot reach you, we will wait for your reply we and can reschedule the delivery of the items on the following day. 2ndattempt re-deliver of your order has been failed; you must settle first and pay again the shipping cost before we re-deliver your order. The same policy applies for the incorrect or incomplete address. For perishable items (flowers, food, cake and etc.) 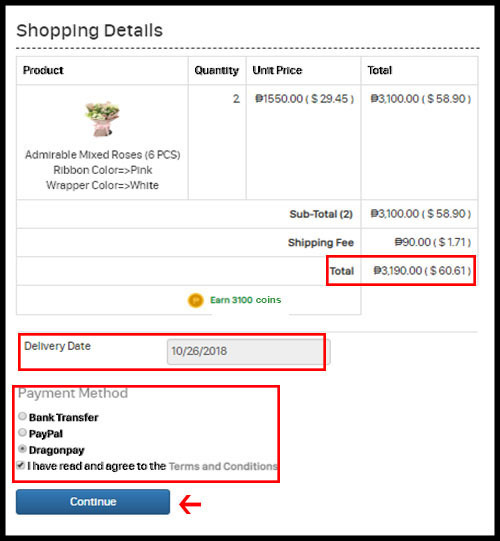 if you want us to deliver a new and fresh item you must pay again the total amount of your order but if not we will redeliver the same item we first attempt to deliver. How do I know if the product is available to purchase? 1.Select a product that you want to purchase. 2. Below of product's price and quantity, there is an information if how many pieces of product is available. Where to get more product's information? 1. Select the product that you want to review the details. 2. At the middle part of the page, there are different tabs that have a detailed information about the product. No, We do not keep your credit card details once your order is already completed; we sent it directly to our banks. The security of all data that you have given to us is very important. We always make sure to secure your credit card information. Note: If you are using a credit card that is not under your name. Please make sure that you have the consent of the credit card holder. 1. You will know that your payment is successful once you receive an email that states that your order(s) is being processed. 2. Then we will give you a tracking number in order to track your order anytime. 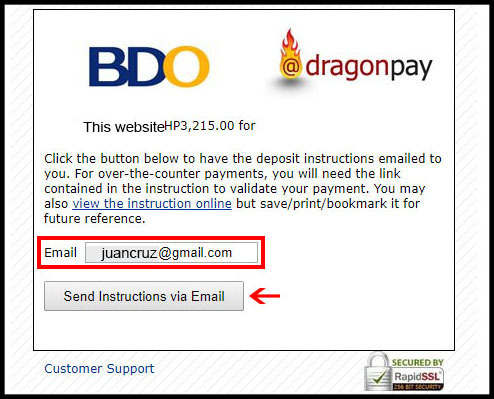 You may also contact our Customer Service Officers to confirm your payment status. 2. Click the I have read and agreed to the Terms and Condition checkbox. 3. Click Continue button. It will redirect to PayPal's website. 4. 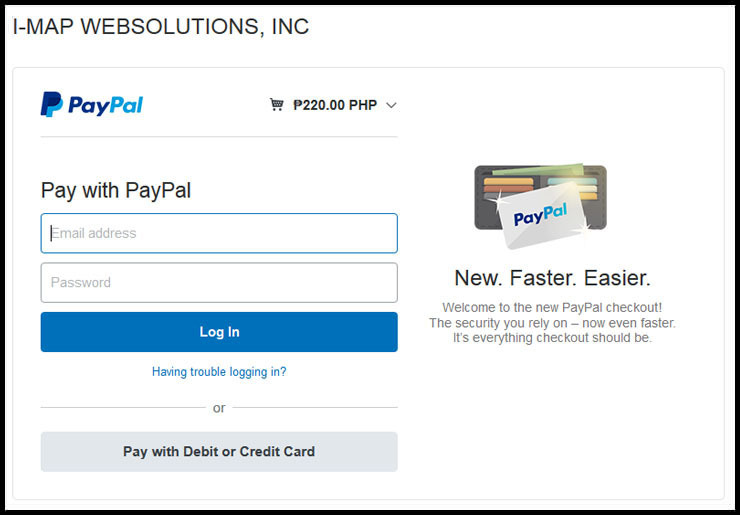 Log-in using your Paypal's account. 5. 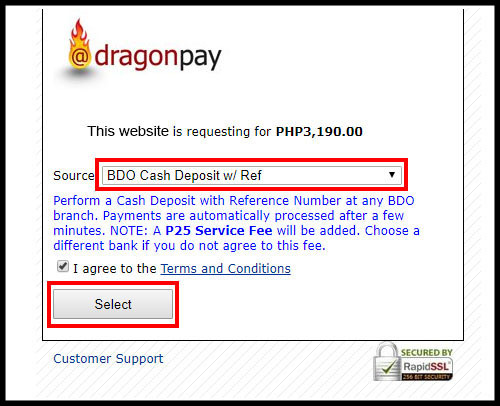 Choose which card account that you want to use for payment. 7. You will receive an email regarding confirmation of your purchased item. Note: In our policy; no payment, no delivery of the purchased item. 4. 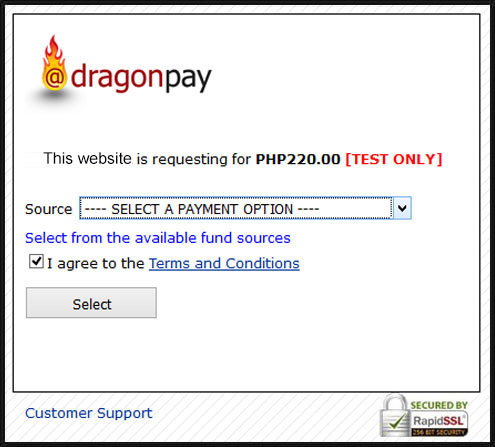 It will redirect to Dragonpay panel. 5. Select your payment option. 6. Click I agree to the Terms and Condition checkbox. 8. Each payment options will provide you an instruction. Please be reminded that you must follow it carefully to purchase your order successfully. Note: In our policy no payment, no delivery of the purchased item. Why am I not able to make a payment with my Paypal account? If it happens that your Paypal Account has same Billing and Shipping Information, kindly disregard it. Just put the correct and complete Billing and Shipping Information on our website for us to process your order. You may also send us an e-mail at info@makatiflora.com for clarification with regards to the Shipping Information. 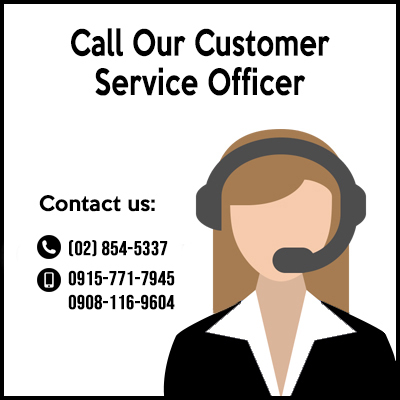 If you need to change the delivery address you should call our Customer Service Officers to make the modification within 12-24 hours. Note: You cannot change your delivery address once your order is being processed. How can I modify the items in my Shopping Cart? 1. Click Shopping Cart icon at the right corner of the search box. 2. You can modify the quantity of the item by pressing the buttons. 3. If you want to remove the item, click the button at the left side of the item's image. 4. 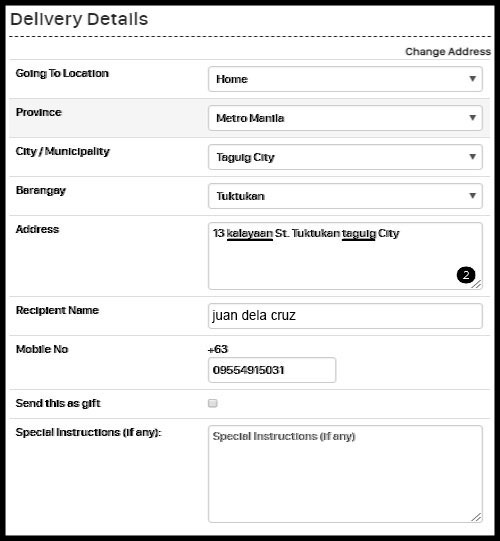 A confirmation box will appear, click OK.
How do I contact Makati Flora? 1. Click Contact Us in the bottom right part of the page or click here. 2. Fill out the required details and click Send. 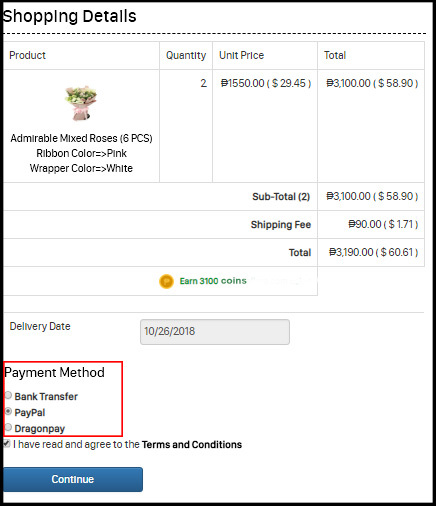 After you complete the checkout process, you will receive an email regarding your order including your product’s name, shipping fee, billing address and other details of an item that you have ordered. Kindly keep this email as your receipt for your reference. We offer flower delivery in different municipalities in Makati which are: Bangkal,Bel-Air, Carmona, Cembo, Comembo, Dasmarinas, East Rembo, Forbes Park, Guadalupe Nuevo, Guadalupe Viejo, Kasilawan, La Paz, Magallanes, Olympia, Palanan, Pembo, Pinagkaisahan, Pio del Pilar, Pitogo, Poblacion, Post Proper Northside, Post Proper Southside, Rizal, San Antonio, San Isidro, San Lorenzo, Santa Cruz, Singkamas, South Cembo, Tejeros, Urdaneta, Valenzuela and West Rembo, Makati City, Metro Manila,Philippines.